Sierra has the best 2nd Birthday ever...almost. We had a fabulous day. Joe and I got to spend it with our little monkey. Check out the highlights: parks, museums, cakes, presents. Every kids dream come true. 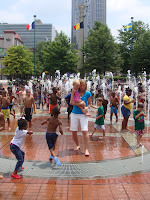 We started the afternoon at Centennial Olympic Park. I thought it would be fun to play in the Olympic Foundtain. 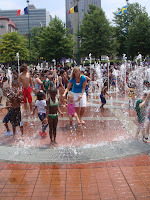 Water shoots up out of the ground and kids play in it. Good times to be had by all. I should have worn my bathing suit becuase I got soaked anyway and Sierra and I would have had alot more fun if I wasn't worried about getting wet. 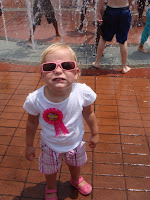 She wouldn't go into the fountains or run around by herself. I had to go. But the water has got to be a bit scary to a Little Bit like Sierra. There were kids everywhere and that freaked her out a bit today. EVERYWHERE. Joe had fun videoing our apprehension as we surveyed the scene. We had lunch after we finished roughing the masses and we got ready for the next event... the ImagineIT Children's Museum. Sierra was all decked out, complete with her "I'm 2!" button so everyone would know that it was her special day! 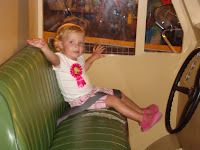 The museum was fun but a bit rowdy for my baby. She was the youngest one, by far, there running around and there were summer school groups there and day care centers and kids EVERYWHERE! Why are there so many kids everywhere!? Geez! It wasn't as cool as I thought it would be and we probably would have had more fun if we had some of Sierra's kid friends with us but we had a great time anyway. 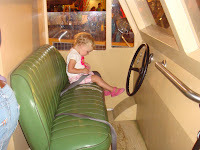 She may be a bit yound still for all the cool things the museum has to offer but she made a good effort at all the play stations. Of course we spent the most time in the supermarket/home section playing with our plastic food. Yummy! 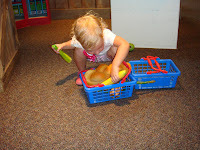 We packed our basket, we used the conveyor belt, we drove the grocery truck to deliver groceries. We did it all! Sierra loves, Loves, LOVES to buckle her seatbelt so she kind of monopolized the truck. Some older kid tried to tell her to get out of the truck and got really nasty to her so she looked at him and said, "No boy! NOOOOOOOOOOOOOO!" and he left crying! My kid is awesome! Way to stand up for yourself in a lady-like manner Sierra! She had a great time running all around and got only mildly frustrated when bigger kids ran into her. She got pushed, knocked down, and yelled at but that was nothing compared to the barrage of homeless people soliciting money from us on the way home. Yikes! 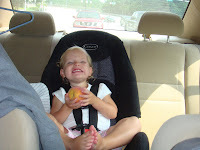 As we were leaving the museum we committed to the Peach Lady that we would only buy and eat Georgia peaches for the rest of the summer. We signed our life away and got a peach. Sierra was all smiles!